These dogs are using their noses! Here is a fun game to teach your dog to use his nose! Enjoy this tip from expert Wendy Nan Rees. A few weeks ago, my friend and bestselling author, Kyra Sundance, joined me on my radio show, Wendy's Animal Talk. Some of the things Kyra talked about were the new, fun and different ways of training dogs as well as sports activities and exercises that that you can do together with your dog. Exercise is as important for dogs as it is for people. It helps them stay healthy and helps prevent them from gaining weight. Well-exercised dogs are better behaved and less likely to test their limits indoors by chewing on furniture and acting hyper. Those unwanted behaviors are usually a sign that your dog is antsy and needs a good play session or a long walk. Fortunately, exercise can be easily incorporated into your dog's routine. As often as you can, take your dog for a walk instead of just letting him out into the yard to do his business. It's great exercise for both of you! If you jog or run and your dog can keep up, take her along. Do you enjoy Frisbee? Let your dog play with you. Try dancing with your dog, staircase sprints, tether ball or monkey in the middle! There is a section in my new book dedicated to sports and exercises, and Kyra's new book will focus entirely on sports, games and exercises that you and your four legged friend can enjoy together. I am intrigued by the fact that so many new sports have cropped up just in the past two years. One in particular grabbed my interest, and I did a little research. I am giving you a sneak peek of what I found and suggestions for creating your own "Scent Hunt" at home. If you are interested in learning more about scent training, I found that that there is not a standardized common name for "Scent Hunt Classes," but rather they fall under some of the names listed below. The wonderful thing about scent work is that your dog is able to do what he loves and is naturally born to do. This is not only great exercise, but it can also be a bonding experience for the two of you. It gives your dog a mental as well as physical work out. In terms of introducing your dog to "scents," the type of scent you use is very important, and you need to consult with an expert to learn how to introduce the scents to your dog. The best way to begin is usually with a food scent. The most commonly used scents are anise and birch as well as clove. They are all used in the form of essential oils. Some apply the scents on cotton, others use leather straps and some use linen strips. The scented item is then concealed in a box. Now, you're ready for your mock hunt. The idea of the game is for your canine friend to find the hidden scented item amongst a few unscented decoys. When he finds it, reward him so he learns this is what you want him to do. 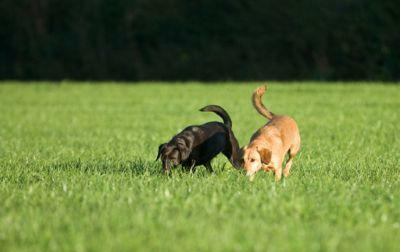 As your dog improves his skills, he can move outside and step up to hunting a scented ball or a dummy. Once he's mastered the skill, you can even add an obstacle course. Try to get your friends to train their dogs to scent. When their dogs are ready, you can all get together and set up a competition; this is where the fun begins. Give your judges a badge, a pad of paper and a timer, and let the games begin. The team that finds the scented item first wins! K9 Nose Work is a great first-timer website to check out if you are interested in learning more about this type of sport.